Preheat oven to 350°F. 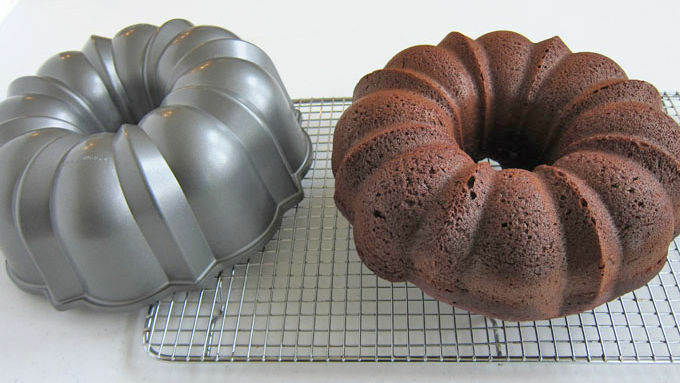 Spray a fluted tube cake pan with non-stick baking spray with flour. 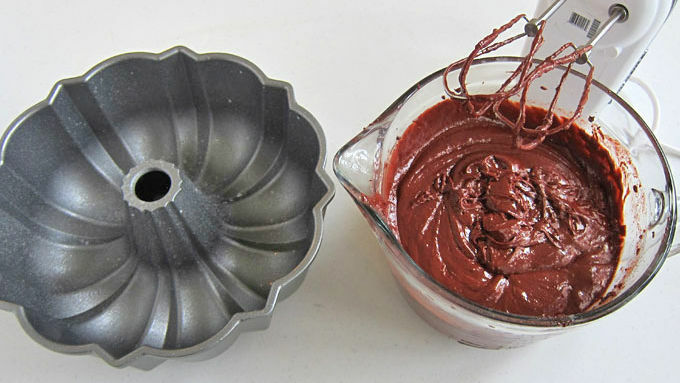 Stir the cake mix, flour and pudding mix together in a mixing bowl. Add the sour cream, oil, water and eggs. Using an electric mixer, beat on low speed for 15 seconds. Increase speed to medium and beat for 2 minutes. Pour batter into pan. 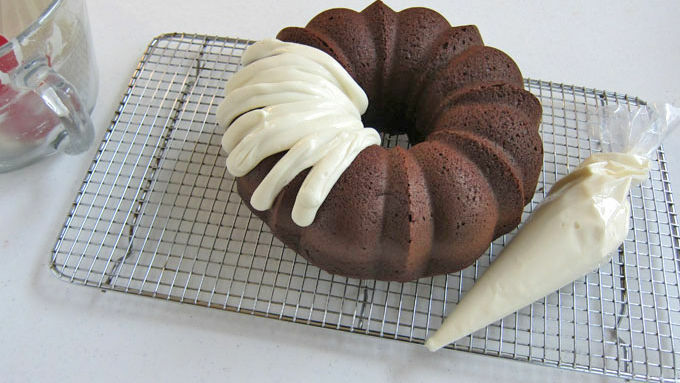 Bake for 38-44 minutes until a wooden skewer inserted into the center of the cake comes out clean. Allow to cool in pan for 10 minutes. 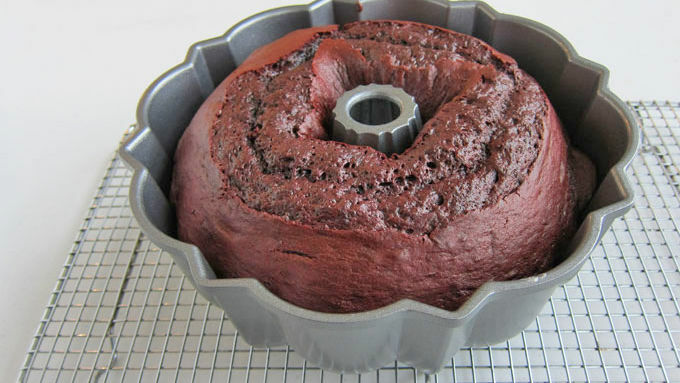 Turn the cake out onto a wire rack and cool completely. Beat cream cheese until light and fluffy. 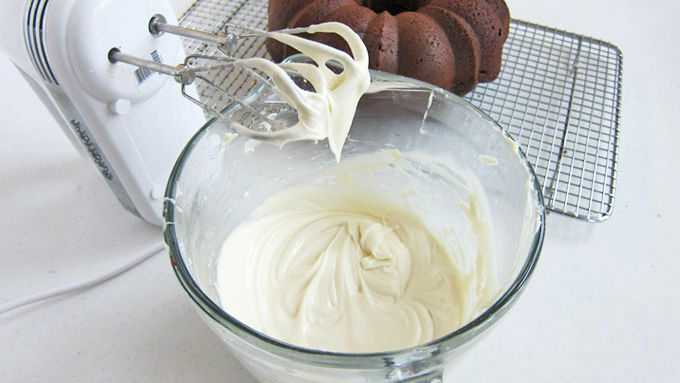 Sift the powdered sugar over the cream cheese, then add vanilla extract and milk and beat until smooth and creamy. Pour into a disposable pastry bag and pipe icing over top of the pound cake. If you don’t have disposable pastry bags, pour icing in a gallon-sized food storage bag and seal. Cut a small piece off one of the corners of the bag and use to pipe your icing. Pound cake. You’ve made it. You’ve ate it. Now what exactly is it? The original pound cake recipe dates back to the 1700s and the name comes from the ingredients. Classic recipes call for a pound of flour, a pound of sugar, a pound of butter and a pound of eggs, but variations on the recipe often cut the ingredients in half to make the cake a little less dense. 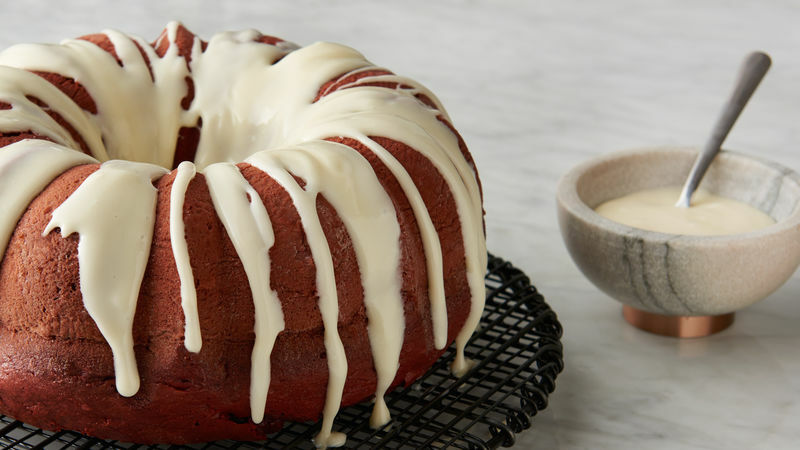 This red velvet pound cake deviates from the classic in the fact that it calls for cake mix which significantly cuts down on the amount of flour needed. However, it still offers the pound cake likeness you’ve come to know and love. Whether you like your pound cakes dense and buttery or lighter and fluffy, you should try one of these pound cake recipes. If you want us to walk you through how to make a traditional pound cake, head on over here.